Much like his beloved Syria itself, Syrian pianist and composer Malek Jandali‘s debut album Echoes from Ugarit cradles a splendid fusion of styles and traditions from across cultures and time. This cosmopolitan ethos becomes Jandali’s signature compositional mark that unites the diverse eight tracks on the album recorded with conductor Sergey Kondrashev leading the Russian Philharmonic Orchestra. In each piece, East meets West, sometimes explicitly, sometimes subtly; but often, where one ends and the other begins becomes irrelevant. Instead the music’s structural integrity is preserved by the interdependence of its melodic, rhythmic, and harmonic components, each of which individually may represent a different style or time but collectively combine in pieces that are reflective of musical eras past yet refreshingly modern. The first and last tracks of the album serve as bookends to the broad spectrum of Jandali’s musical melting pot. With clear historical illusions to an era and place influenced by Arab culture, “Andalus” dramatically opens the album: the rhapsody’s introduction, which features a rhythmic augmentation of the melody played in octaves on the piano supported by rolled chords, gives way to a seductively playful Eastern melody that dances atop tango rhythms articulated in the strings and on the piano. And while “Andalus” presents un-mistakable cultural evocations, the album’s last piece, “Arabesque,” features a more nuanced melding of styles. The waltz-like opening presents a sweeping melody—drenched in nostalgia—that is initially played in the strings and eventually echoed and elaborated in a piano solo. Subsequently, as the primary musical thought is tossed back and forth between the piano and the orchestra, interludes of more Arabic-like music—denotable through the addition of vibrant, rhythmic sections with sharp accentuation, beautiful ornamentation, and varied instrumentation (particularly when the solo oboe plays the melody)—are skillfully woven in. For all of its magnificent moments, however, Echoes from Ugarit has its shortcomings. The album lacks variation in that all pieces are piano concerto-like, showcasing solo piano with orchestral accompaniment. 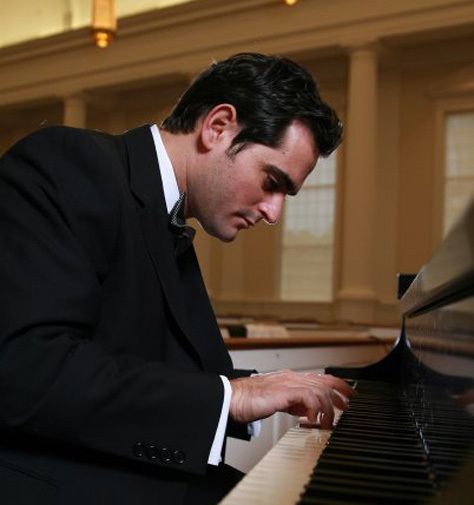 Jandali spent the greater part of his musical education training as a pianist, studying at Jugendmusikschule in Germany where he was born, at the Conservatory of Music and the High Institute of Music in Damascus, Syria, and at the North Carolina School of the Arts before beginning his forays into composition. Consequently the structure of his music—most of which hovers in minor keys—tends to showcase him more as a pianist than as a composer. (For example “Piano Dream,” where a whimsically ornamented melody twists and turns over fast-paced, broken-up chords in the left hand of the piano accompaniment, shows his technical ability to play crisply and precisely without ever sacrificing the continuity of the musical line.) But Jandali does not provide music that is exclusively for orchestra or that prominently features instruments other than the piano. The compositional structure of the music he does provide, however, has several strengths. Jandali is particularly adept at achieving a fluid dialogue between the piano and orchestra, at times using one to comment on or punctuate the other’s musical idea or initiating a call-and-response figure between the two. “Leil” (“Night”) most vividly demonstrates these exchanges, especially between the piano and solo instruments such as the clarinet, flute, and horn. The piece is filled with the rich, brooding harmonies reminiscent of German romanticism and features a vacillation between extremes of emotions, musically captured through sharp contrasts in dynamics (loud versus soft) and orchestral texture (dense versus thin). Perhaps Jandali’s most intriguing piece is the one from which the album draws its name. “Echoes from Ugarit” demands that listeners be engaged more on an intellectual level than on an emotional one. Its theoretical underpinnings, which one understands only by reading the CD liner notes in Arabic or English, outshine their aural manifestations. “Echoes from Ugarit” is inspired by the oldest music in the world found on tablets dating back to 3400 BCE in the ancient Syrian city of Ugarit. These tablets denote an accompanied, sung hymn of an infertile woman directing her prayers to a moon goddess. In light of this information, the compositional structure makes perfect sense: with the tonic repeatedly sounding in the bass and a line of ascending and descending triplet thirds and seconds in the low stings and bassoon, a haunting melody floats above complex and often dissonant harmonies. Jandali gives listeners a dark and sullen supplication of a grieving woman; however, the piece is defined primarily by its harmonies, and its chant-like melody leaves listeners wanting. Consequently, as in a stream of consciousness, the piece has forward motion without a definite shape or direction. Still in naming the album Echoes from Ugarit—it encompassing the numerous musical and cultural colors that it does—Jandali reminds audiences that even an ancient civilization and the place that cradles it is more than a lifeless point of origin. The musical echoes to which it gives birth go on to ricochet between eras, places, and cultures, with some frequencies becoming lost and others reinforced depending on the space in which they are cast. Jandali’s debut work will leave listeners blissfully content for the moment and eagerly awaiting where he will take them in his future releases. Syrian-American soprano and pianist Salma Al-Shami holds a Bachelor of Music in voice and opera performance and a Bachelor of Arts in political science from Northwestern University (Evanston, IL). Performing regularly in New York where she currently resides, she will be a Fulbright Fellow in Syria for the 2009-2010 year before returning to Northwestern to pursue her doctoral degree in political science. Salma, thank you so much for writing this review. Malek will be happy to see it. Thanks for posting this. Now I know what my next CD purchase will be. Thank you for posting this; now I know what my next CD purchase will be. “Even an ancient civilization and the place that cradles it is more than a lifeless point of origin.” Excellent! This reminds me of Edward Said. The “transversality” of places and times finds its most perfect expression in music, but Miss Al-Shami knew how to put into words feelings and thoughts inspired by that music, thus giving readers a taste of what they would be missing if they fail to discover Mr. Jandali’s CD. I thank the writer for sharing with us the subtilities picked up by her professional and fine ears. At times I thank god for being a non-suspecting listener and not a critic. I did not read the press release – if indeed there has been one – for the launch of the CD. I feel however that Mr. Jandali did not intend his work to be anything other than what it was: musical poems of differing tempos and rhythms evoking nostalgic feelings among non-suspecting listeners like myself who I hope will continue to go and buy the CD and eagerly await future releases. I cannot blame his work for “lacking variation” or for its being “piano concerto like”. Did he claim otherwise? The moods, the melodies and above all the fact that Malek’s debut took off from Ugharit is a most befitting tribute to Syrians who continue to identify themselves with this place no matter how far away they chose to live. Thank you Salma for bringing Malek’s work to our attention. The wonderful review for Syrian composer & pianist Melek Jandali’s album is deserving of comment not only because Mr. Jandali is such a wonderful musician, but he also shows himself to be so aware regarding the history of music and the long interrelationship between Arabic and European culture, music and art. Despite strains, there is much love between these two cultures, and so much respect for the contributions Arabic culture, art and music have made to the cultural language of humanity. Mr. Jandali is contributing in a wonderful and meaningful way to this ongoing tradition. It would be hard to find a more poetic comment than the words of Albanez in our attempt to describe the indescribable, the sense of humanity we must feel when reflecting on the beautiful and transcendent , the cultural relationship we have known with our Arab friends and companions over so many centuries. Thank you , Mr. Jandali for your valued work continuing this great tradition and for such beautiful music.